My friend Ned is heading for Spain next month and I couldn’t be more envious. Not only will he be taking in all the glorious sights, he’ll be eating tapas at every turn. If only I could stow away in his luggage. Someday, I hope to travel to Spain, too. In the meantime, I’ll just have to make my own tapas. This tortilla with chorizo, potatoes and peas is a good start. 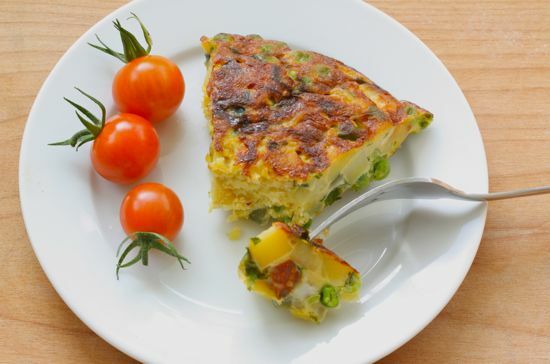 In Spain, tortilla refers to a sturdy omelet rather than the thin flatbread known as a tortilla in Mexico. A cousin of the Italian fritatta, it’s bar food usually served with other appetizers–collectively known as tapas–and a glass or two of wine as a prelude to late-night dining. But it also makes a great light supper. Spanish cooks prepare tortillas with everything from Swiss chard to baby eels in the filling, but the classic served in virtually every tapas bar is based on potatoes. Spicy Spanish-style chorizo pumps up the flavors in this variation adapted from a recipe in “Tapas, The Little Dishes of Spain,” by Penelope Casas (Knopf, 1985). I’ve fiddled with the recipe a bit to cut down on the oil and revised the instructions. Flipping the tortilla over several times during cooking, as experienced cooks do in Spain, requires more skill than I possess and the likelihood of tearing the omelet mid-flip is just too high. It’s much easier and more reliable, for me at least, to cook the tortilla on top of the stove until it’s almost done and finish it off under the broiler. Flip it onto the plate, bottom side up, when you serve it and no one will know the difference. Just be sure it’s firm and cooked all the way through. A good nonstick pan that can withstand the high temperatures of the broiler is essential and it takes some patience to cook the potatoes at a low enough heat to cook through without browning. Still, this is a simple dish that pays off with big flavors. The secret is in the dry, Spanish-style chorizo. If you can’t find it, pepperoni or linguica will work but be aware that they may carry more heat than the Spanish sausage. I first made this tortilla as my contribution to a family barbecue and it drew compliments. More recently I’ve made it for light suppers and ate the leftovers for lunch. With this tortilla on my plate and a splash of Spanish rosÃ© in my glass, I’ve come as close as I’m going to get to Barcelona this year. Peel potatoes and cut into 1/4-inch cubes. Heat oil in 10-inch nonstick skillet that can withstand high temperatures and add potatoes. Cook slowly over low heat, stirring occasionally until potatoes are cooked through but not brown, 10-15 minutes. While potatoes are cooking, chop onions and remove skin from chorizo and cut into 1/4-inch cubes. Set aside. Beat eggs with salt in a medium bowl. With a slotted spoon, remove potatoes from skillet and stir into eggs. You will want about 1 tablespoon of oil left in the pan. If there is more, drain it off and reserve. Heat skillet over medium heat and sautÃ© the onion until limp. Add the chorizo and cook for another couple of minutes until the sausage begins to give off its oil. Stir in peas and remove pan from heat. Add this mixture to the bowl with eggs and potatoes and let sit for 5 minutes. Stir in cilantro. Preheat the broiler and place a rack near the top of the oven, so the skillet will be several inches below the broiler. Wipe out skillet with a paper towel. Add 1 tablespoon oil, using reserved oil if possible, and heat until very hot. It should just begin to smoke. Add the egg mixture and spread it quickly into an even layer covering the bottom of the pan. Reduce heat to medium and gently shake the pan back and forth over the burner to keep eggs from sticking. You also can tilt the pan and use a heatproof spatula to lift the edges of the tortilla and allow uncooked egg to slide under the tortilla to continue cooking. When the bottom is a deep golden brown and the top looks almost dry, slide the pan under the broiler and cook until the top is browned. Watch it carefully so it doesn’t burn. Remove pan from oven and let cool for few minutes. Run a heatproof spatula around the edges of the pan to loosen the tortilla. Place a plate upside down over the skillet. Using oven mitts or hot pads, hold both the plate and skillet together and flip them over so the plate is on the bottom. The tortilla should slip right out of the pan and onto the plate. Let tortilla cool completely and cut into wedges or small squares to serve. This also looks perfect for Ned’s wife.